Announcing the winners of the 33rd ever Right Place Photo Caption Contest! Presenting the top 20+ captions for this picture from AP Photo/Rob Carr via Yahoo! Once the colossal black hole of ignorance that was Ted Kennedy began sucking in neighboring galaxies, the Universe was doomed to an untimely end! #20: "Remembuh, nothing says 'good job' like a firm, open-palmed slap on the behind." #18: "This is how my dad used to salute Hitler." #17: "No thanks, I'll pass out here." #16: Teddy gives the signal for his favorite size beverage... a fifth. #15: "Waiter... Yeah, 5 shots over here!" #14: "Hopefully, the edge of this picture will hold me up!" #13: The letter "H" is brought to you by Ted Kennedy... "H" as in "hammered" and "hosed". #12: The bloviating killer then drunkenly hurled a throwing-star at the "Remember Chappaquiddick" heckler, embedding it into his neck. #11: In his latest frat prank for the OWL CLUB, Senator Kennedy plays a rousing game of "Ninja Frisbee" with Justice Sam Alito. #10: Senator Kennedy pauses to form a crescent and star symbol of Islam. #9: "Live long and prosper? Ha! Between state-run health care and the taxes to pay for it, good freakin' luck with that!" #8: Senator Kennedy sees stars as he wanders out of the Congressional drunk tank. #7: That's not Ted Kennedy doing the robot, that's a robot doing Ted Kennedy! #6: "Damned DT's! Outa the way, dammit! I can't see that cocktail waitress who's waving her pantyhose at me." #5: Witness later recalling: "Well... he caught one, and the one to the back of the head did no damage, but the lower one took out his brain." #4: "Oh, yeah... I gotta stick to Scotch; that way, I just see stars. Vodka makes me see little Oldsmobiles! #3: Pie-Eyed Flatulent Ninja Senators - coming to NBC this Fall! 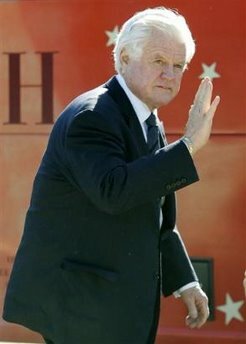 #2: Ted Kennedy demonstrates the proper way to signal for a right turn off of a bridge. #1: "What? The campaign bus is out of ethanol? No problem, I'll just go breathe into the tank for a few minutes." And, in case you haven't yet seen it, here are the updated overall rankings for the first 30 caption contests!!! Is John Howard To Blame?